In our backyard we have a variety of animals that visit–both wild and domestic. One day, my son and I were in our yard enjoying a warm fire in our fire-pit, when a black and white cat appeared. I know of all our neighbors’ pets and this one I had never seen before. It appeared skittish and wouldn’t come too near. It just watched us. Having two cats of my own I set some food and water out for the kitty. The next few times he came closer to us and eventually let us pet him. I set my large cat carrier with a blanket in it for him to have shelter and I tried to find out who he belonged to. That was in September. No one has come forward as his family so I have been left feeding him and providing him with some love. 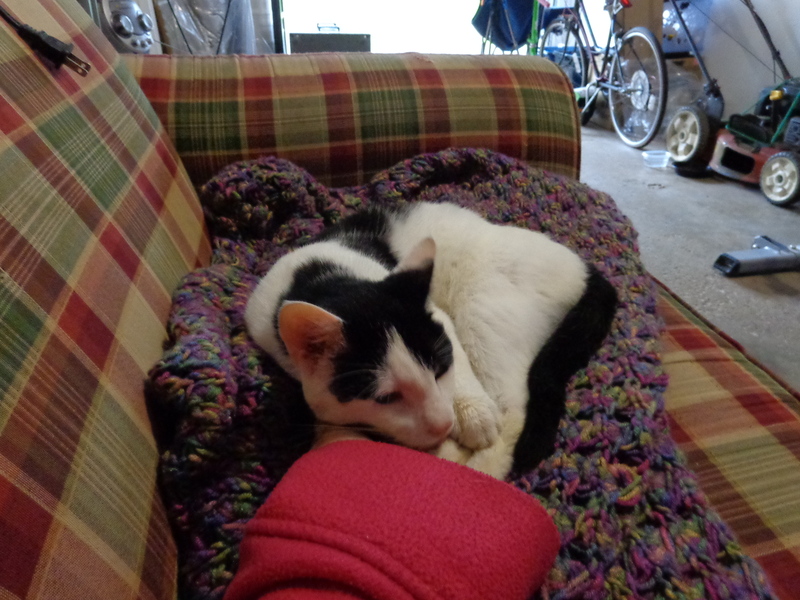 After talking to some of my neighbors, they too are leaving food out for him and now we leave our garage open a little so he can have warmer shelter as the weather has turned colder. He gets to sleep on a couch with his blanket. My neighbor across the street has offered to get him neutered and hopefully we can get him his shots.